I am also seeing this when trying to debug a new Functions project from a new install of VS2017 15.5.2. Could not load assembly WindowsAzure.Storage (or similar). Nothing worked, until I downgraded WindowsAzure.Storage to 8.6.0. This is a version I've seen when NPM was restoring dependencies for Functions SDK. Downgraded, cleaned, re-compiled - voila! Also had same issue with WindowsAzure.Storage 9.0 and 8.7. Had to downgrade to 8.6. Thanks for the workaround evgeny-n ! Thanks @evgeny-n for your workaround. Updating the Azure Functions and Web Jobs Tools to the latest version might also help. Am getting same error message when running azure functions project locally. Targetting .net standard 2.0. Using .net sdk functions 1.0.6 and it worked ok initially for the "Function1" freebie function. Then added reference to Microsoft.AspNetCore.Authentication.JwtBearer and immediately get this error. I also tried installing System.IdentityModel.Tokens.Jwt package [i just want to parse a jwt]. this works in local debugging but fails when I publish it to azure. Is it just me or is version hell back with a massive vengeance in .net core space - possibly worse than ever before? Just for fun, I get it on the actual Azure portal. The code is merely from the Azure samples. I've uploaded the correct file to the folder in question, I'm certain it's in the right place as all the other dlls reside in the webRoot. However, it's blatantly giving the same message? "The function runtime is unable to start. 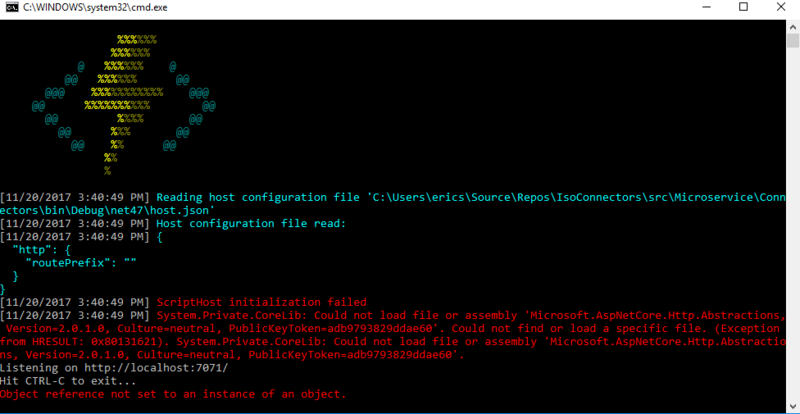 System.Private.CoreLib: Could not load file or assembly 'Microsoft.AspNetCore.Mvc.Abstractions, Version=2.0.3.0"
Is this still my inexperience with the platform (quite plausible, I know) ? I am getting something similar, but for cosmosdb trigger functions. Getting the same thing, after adding Microsoft.AspNetCore.Authentication.JwtBearer. VS 2017 15.7.1. 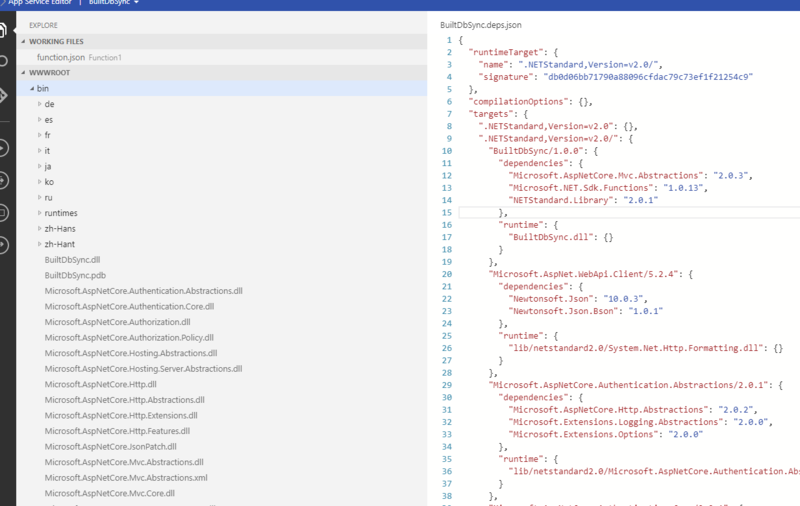 Azure Functions and Web Jobs Tools 15.0.40502.0. [5/14/2018 2:13:06 PM] Host lock lease acquired by instance ID '0000000000000000000000003E437901'. [5/14/2018 2:13:09 PM] System.Private.CoreLib: Exception while executing function: graphql. graphql-dotnet-builder: Could not load file or assembly 'Microsoft.Extensions.Options, Version=2.0.1.0, Culture=neutral, PublicKeyToken=adb9793829ddae60'. Could not find or load a specific file. (Exception from HRESULT: 0x80131621). System.Private.CoreLib: Could not load file or assembly 'Microsoft.Extensions.Options, Version=2.0.1.0, Culture=neutral, PublicKeyToken=adb9793829ddae60'. Updating "Azure Functions and Web Jobs Tools" extension fixed the issue for me, although I am only trying to get it to run locally. I have 15.0.40502.0 installed of "Azure Functions and Web Jobs Tools"
That's the same version I am have, but I'm not using EF Core. 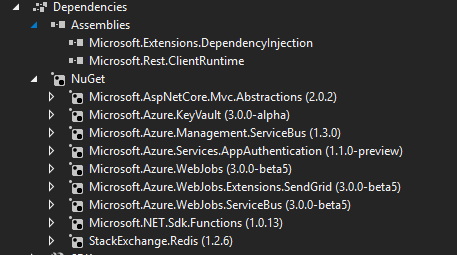 I was able to get further by downgrading some of the nuget references to be the same as used by the tools, but only got so far down that path. Not able to reference EF Core without getting similar errors. I have not had this issue for some time now. Currently running on v36 all nugets on latested(EF, AzStorage and AzEventHub). Using VS 2017 as well. Double check the host version. Maybe the AzHost is npm installed global???? A significant number of changes relating to Functions V2 GA have happened since this issue was originally opened and the underlying issue has been addressed. Anyone who is still experiencing issues should feel free to open separate issues.